BOOKS for Books by theme, Annuals & Outlooks, and Book Series. PAPERS for Journals by title, Annuals & Outlooks, and Working Paper Series. STATISTICS for Statistical Databases, Key Tables, Statistical Publications, and Sources and Methods publications. FACTBOOK for all editions of the OECD Factbook. GLOSSARIES for OECD reference and glossary publications. Enter some terms into the SEARCH field to find related content. The search function scans titles, abstracts, authors, ISBNs/ ISSNs/DOIs, tables of contents or countries. one of 17 THEME collections to access all related content. a COUNTRY and all its relevant content. Click on “OECD.Stat” to access all dynamic databases available from the OECD allowing experienced users to make cross-database queries. Click on a specific title to access a unique view of the selected database, including options for creating customized tables, a data citation tool and links to related content. 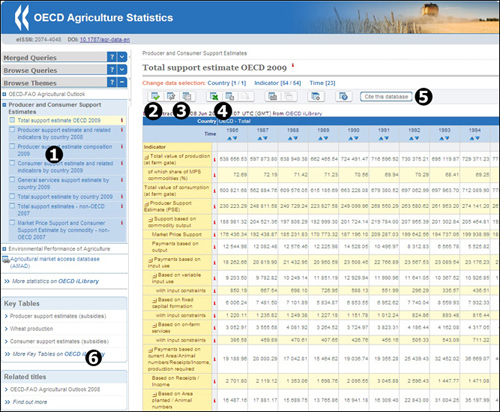 Click on “Country tables” to view a selection of country-based key statistics in HTML, XLS and PDF formats. Click on a key table set to view a selection organised by theme. The tables are accessible in HTML, XLS and PDF formats. 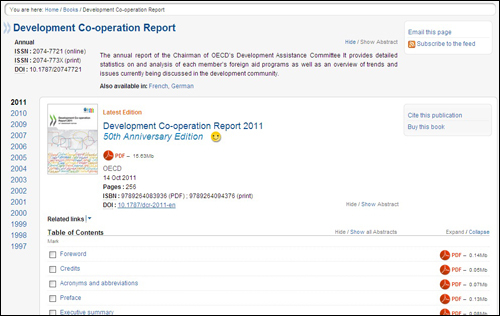 Click on “OECD Factbook” to access a unique cross-section of key statistics as tables and graphs from the OECD accompanied by a brief introduction, definitions, notes on comparability, long-term trends and sources. Click on a publication title to access the homepage of a statistical periodical, book series or annual/outlook. List of available datasets and tables in the selected database, the name of the displayed table is highlighted. Table dimensions – click icon “2” or a dimension name to change the selected variables in any dimension. Click “View Data” at the bottom of the panel to return to the updated table. Pivot dimensions and Options – click icon “3.1” to change the layout of the table via drag-and-drop with the cursor; click icon “3.2” to customize the view of the displayed table, such as hide/show empty rows, hierarchies, number of decimals, dimension labels or codes, add column/row calculations, etc. Click “View Data” at the bottom of the panel to return to the updated table. Data Download – click icon “4” to download the displayed table in XLS format (up to 100,000 data points) or a larger table in CSV format (up to 1,000,000 data points). The panel also displays predefined tables ready for downloading if available. Cite this database – click to open a pop-up window providing the recommended citation for the displayed table. Also offers the option to download and integrate the citation into various bibliographic reference platforms. Related Key tables and titles – click a title to access predefined key tables and publications related to the current database. Enter some terms into the quick SEARCH field to find related content. 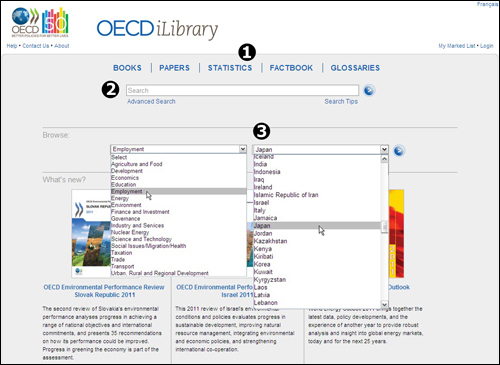 on the top of each page of OECD iLibrary. The quick search function scans titles, abstracts, authors, ISBNs/ISSNs/ DOIs, tables of contents and countries. Note: this field will not search full-text content – see Advanced Search. Enter one term or more into the Option fields and use AND, OR, NOT to connect the fields appropriately. If desired, define the search further using other options on the page: date range, content language, imprint, thematic collection, country or sort order. By default search results are sorted by relevance and by date. “Date” to sort only by date. “Content Type” to sort only by content type in alphabetical order. “Title” to sort only by title in alphabetical order. Click again on a column title to reverse the sort order. Click on “Hide/Show all Abstracts” to toggle between a view with abstracts of each item displayed or hidden. Check the “Mark” box of any search result of interest and click the “Add to Marked List” link at the bottom of the column to keep the items in memory for the browser session. You can print, email or download the bibliographical information of your marked items by clicking the “My Marked List” option at the top of any page. Check desired box and click “Add to Marked List” link at the bottom of the search results listing to finalise the addition of the selected items to “My Marked List” items. Date of publication. Note that a result for a series,data collection or table collection would not have a date displayed. Content Type (article, book, chapter, data, data collection, graph, issue, serial, summary, table, working paper, etc.) and content language. Content item information: title in first line (click to access); additional information based on content item in the following lines: author/publisher, number of pages, source publication (click to access). Available full-text formats (click to access): PDF, XLS, WEB, DATA, READ. Click on “Hide/Show Abstract” to display or hide abstracts of serials, publications or chapters. Click on the available language choice to display content page for the selected language. Click on the full-text (PDF, WEB, XLS, DATA) link to view it. Access to the full-text item may require special access rights. If you have access, this will be indicated by the display of a yellow smiley-icon. Click on a chapter title to access the chapter page. Click on “Multilingual Summaries” to view a list of available summaries in various languages. Click on the edition year on the left-hand side to access a different edition of an annual/outlook or volume/issue of a journal. “Email this page” – sends a link to the current page to yourself, a friend or a colleague. “Subscribe to the feed” – sets up an RSS feed for the current content. This function behaves differently according to your web browser. “Cite this content” – provides a pop-up window displaying the recommended citation for the content item. Additionally offers the option to download and integrate the citation into various bibliographic reference platforms.